It doesn't happen often, but every once in a great while, I give out a picture of me. 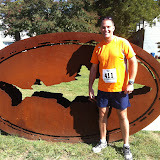 After all these years (7, to be specific), I finally got to my first Dogfish Dash on September 30. At that point in my marathon training schedule, whether it was a wise idea remained to be seen. My training schedule called for an 18-20 mile run and the Dogfish Dash was a 10-K (with a 5-K option). The races started and ended along the side of the main brewery building and the courses weaved their way through the neighboring community and farmland. While the support from the residents along the course was surprisingly sparse (based on my experiences in many other "neighborhood races"), there was no shortage of post-race excitement and support for their runners and their families and friends back at the brewery. I won't bore you with the details of the race. We ran. We finished. Or, at least that's the view of runners by most non-runners, right? So, what do you say, on to the beer? The race began at 8 a.m. on a Sunday morning and most runners were across the finish line not much later than 9 a.m., which conveniently was the time the brewery was allowed to start serving beer. But don't let the time of day fool you; the runners were quick to jump into their allotment of three beers that came with the race participation fee. Unfortunately, the Indian Brown supplies were drained quickly. No slouches, though, Shelter Pale Ale and 60 Minute IPA picked up the slack for plenty of refreshment as the party picked up. Live rocking music was provided and a breakfast buffet was served up during the two-ish hour long post-race party. Lines quickly grew long but that provided the chance to get to know other runners/beer lovers in line. Winning the men's 5-K race at the wonderful age of 52 was Greg Cauller (time: 18:08!) and 35-year-old Lynn Knothe for the women (time: 19:58). On the 10-K side, the intersection of craft beer and running was no where more evident than with the men's winner, homebrewer Jeff Powers sporting an impressive 33:14. He was subsequently featured in Draft Magazine by The Beer Runner. On the women's side, Lauren Kobylarz took first place overall with a time of 40:45. All in all, a beautiful, fun, and healthy weekend in Delaware. Glad you finally made it to the Dash, Bryan. Hope to see you again next year. April signups will be here before you know it. Cheers!